GoSustaino: PCBs with bacon and eggs, please. PCBs with bacon and eggs, please. For those of you that like a greasy, spoon meal once in a while, you need to know order no PCBs with your breakfast. What the hell am I talking about? The secret is not in the sauce, but in the Teflon. Teflon is associated with PCBs (Polychlorinated Biphenyls), which are the top-dog nasty toxins known for messing with our endocrine system. According to research, Teflon releases nasty toxins, especially PCBs, into our food through the good ole’ cooking process. 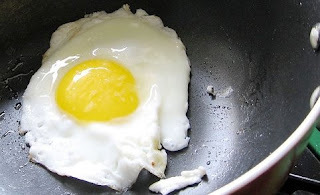 A classic fried egg is all it takes along with a few scratches here and there on the actual surface of the frying pan. You might be thinking so what? My cast iron pan gives me a little extra protein (and a little lead) in my meal and I really don’t want to soak my pots and pans after cooking; hence the Teflon coating. The problem is that Teflon is an endocrine disruptor. The chemical cocktail is transforming thyroid levels for young men and women by altering the thyroid gland which secretes important hormones that regulates your brain, metabolism, nerves, energy levels and much more. Too many cases are popping up of young teenagers needing “synthroid” the classic prescription of choice by doctors to help regulate one’s thyroid gland, and at such young ages it is an indication linked to the on-going phenomena of PCBs in our food, furniture, and other household products. Trust me - you’ve seen these people who are have unregulated thyroids, but it is hard to detect unless you have your blood taken and screened for low or high levels of thyroid. Usually, their eyes are more “buggy” and popping out, which is a symptom of hyperthyroidism (high thyroid). The opposite is extremely sluggish, depressive feelings followed by weight gain, which is hypothyroidism (low thyroid). The other indication often seen with younger children are neurological disorders, low birth weight, and depressive responsiveness. And so what if you have a little “PCB” in your body? Chances are we all do, but we can at least reduce our risk and the amount by knowing what we put in our body. Check out the links for more information and health implications. PCB Exposure in Children and EPA Health Implications.